I've recently picked up a few new Photoshop shortcuts related to typography so I figured that I'd share them. If you spend a lot of time in the program, you probably have seen most of these, but hopefully there's a new one in here for you. I know I always like finding ways to be more efficient and everyone likes to learn a new trick, right? 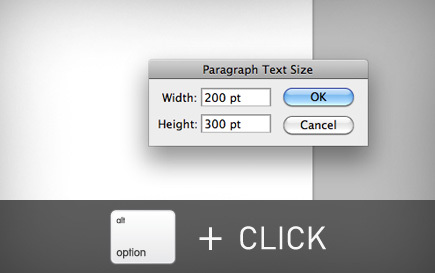 (with type tool selected) Option + Click. If you know you need a column of text that is a specific number of pixels wide (or tall), this can be a faster solution than using your guides and rulers. 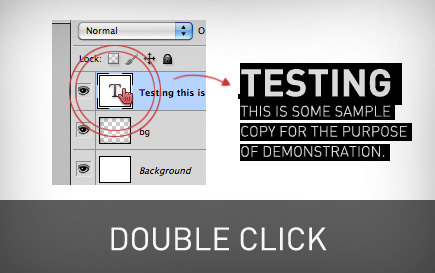 Double Click Text Layer Icon. This is one I haven't yet incorporated into my workflow but seems helpful. 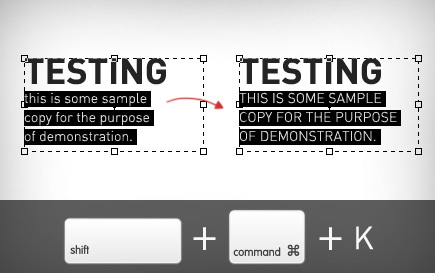 Double-click the "T" in the layer palette and all the text on that layer will highlight, then make desired changes. Command + Return. Close a live text box. 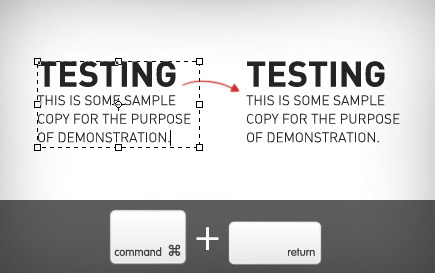 This one's nice because simply hitting return will just add a line break to the text - d'oh! Pressing esc and losing the changes you just made isn't really helpful either. Hit cmd + return, and then you're free to jump over to the Move Tool or whatever else you might want. (Props to Ethan for this one - I'm pretty sure he mentioned this one the other week.) *Update: If you're using an extended keyboard, simply pressing the enter key will also close the text box. Thanks to all the commenters who pointed this out! 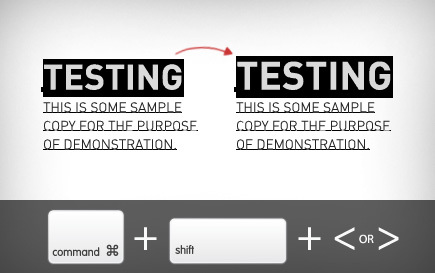 Command + Shift + K. This can be a quick way to toggle caps for any text. It's the same thing as hitting the all caps button on the Character panel. Pretty straightforward. Command + Shift + </>. This can be helpful if you're just bumping the text down one point size or if you're wanting to get a feel for the sizing on the fly. Hitting option as well will change the font size by 10pts instead of just 1pt at a time. 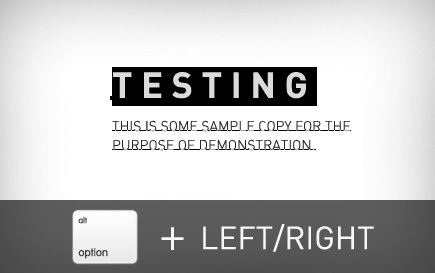 (with text highlighted) Option + Left/Right. Increases the spacing between all the letters in the highlighted area. Option + Left/Right. 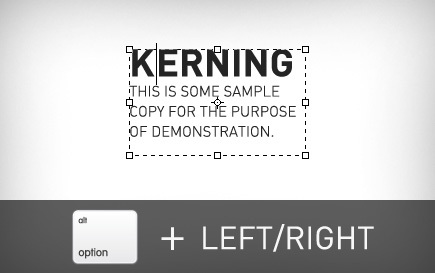 I'm assuming most people use this one already but a necessity if you're kerning some headline text. Here are a few random quick ones that might pop up while you're designing. 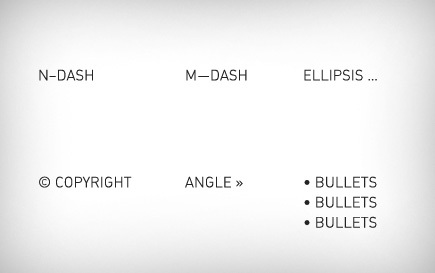 I haven't memorized all of them (and there are certainly plenty more) but knowing the n-dash and m-dash is definitely worthwhile. So those are a few shortcuts that I've been finding useful lately. What about you? I'd love to hear if you have any other typography tricks that you find yourself using frequently. Anybody have some custom shortcuts that you use all the time? You can use the comments below to discuss.